The ad campaign was designed to market the grocer’s new line of palm-oil-free products. But the commercial was never aired because it was deemed “too political” for TV. But the eco-conscious supermarket chain, which recently banned single-use plastic packaging, hasn’t given up getting its message out. 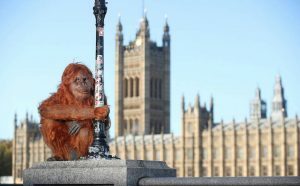 Now the company has released a life-sized animatronic orangutan on the streets of London to show humans what it’s like to have their “habitat” invaded. 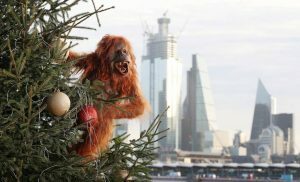 “The supermarket chain has turned to special effects technology befitting Hollywood to create an ultra-realistic robotic orangutan for a stunt to raise awareness of the plight facing the species from deforestation,” reports The Guardian. 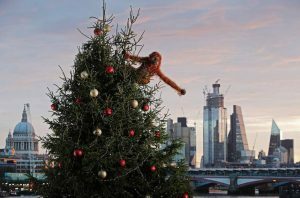 The orangutan first appeared clinging to a Christmas tree on Coin Street in south London, before moving to Oxford Street and several parks in the capital. 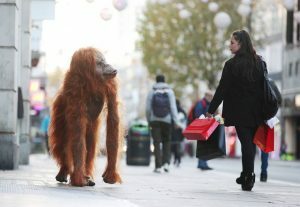 It’s now making appearances at a number of Iceland stores around the country, apparently “searching for a new home.” The orangutan is controlled remotely by a specialist puppeteer. “Our stranded, distressed orangutan is a stark and potent symbol of the effects of deforestation,” said Richard Walker, Iceland’s managing director. Palm oil is found in almost half of the items in the supermarket, including baked goods, confectionery, shampoo, cosmetics, cleaning agents, washing detergents and toothpaste. “The resulting monoculture is one in which the native orangutans, Sumatran tigers, pygmy elephants, rhinoceroses, and sun bears cannot survive,” TreeHugger reports. 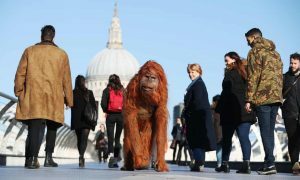 Eighty percent of orangutans’ habitat has disappeared in the past two decades and 25 die daily, the ad claims. Palm oil production threatens orangutan extinction within 5-10 years, and Sumatran tigers in less than 3 years, according to the World Wildlife Fund. An online petition on Change.org calling for the ad to be allowed to air has drawn almost a million supporters. The advert was originally made by Greenpeace as part of their own campaign to bring greater awareness to the palm oil issue & had been used extensively by Greenpeace for several months. Iceland were so impressed with it that they asked Greenpeace if they could use it for their Christmas advert as they had recently removed palm oil from all their own brand products. So the statement that “The ad campaign was designed to market the grocer’s new line of palm-oil-free products.” is incorrect. Also, the reason it was banned wasn’t because the advert itself was too political, it was actually because Greenpeace is classed as a political body and as the advert had already been widely used by Greenpeace, the association between Iceland & Greenpeace was too strong. how do I share on my FB page?